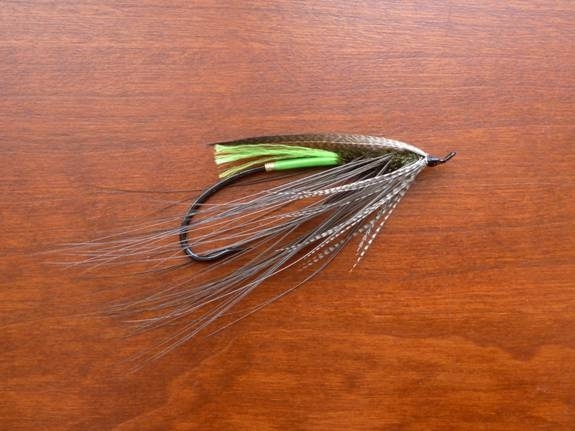 This pattern is a hybrid of a Green Rat body (sans rib) and a traditional Spey fly, and was designed specifically for the beautiful Petite Cascapedia River. The first few days following its baptismal, it accounted for 6 rises, 5 solid takes and 4 lovely June salmon to net. It deserved a proper name! “Brûlé”, its birthplace – “Mc”, in honor of the McWhirter Clan who’ve run Camp Brûlé for 4 generations – “ Sprat”, a contraction of Spey and Rat. Thus born and duly christened, “The Brûlé McSprat” was conceived and tied by Doug Schlink, but this particularly stunning rendition was tied by the eminently more talented hands of master tier, Ben Bilello, www.benbilello.com/salmonflies/.